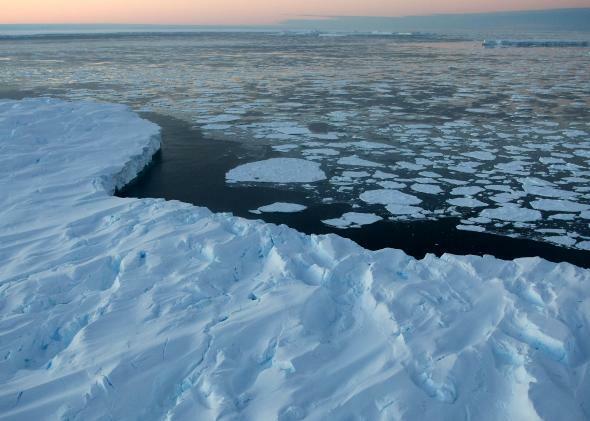 The new worst-case scenario for ice loss in Antarctica. The future of Antarctica is the future of Earth. In May of this year, a pair of science studies caught the world by surprise. Though it’s supremely depressing that New York City, Mumbai, and Guangzhou will most likely be underwater by the year 3000, those studies felt a bit abstract for those of us concerned about worst-case climate scenarios in our lifetime. With the most ice on Earth, Antarctica holds the key to the world’s coastal fate. But up until now, there hasn’t been a reliable upper bounds on how much Antarctica as a whole may contribute to global sea level rise over the relatively short term of the next several decades. A new study published Wednesday in the open-source journal Earth Systems Dynamics provides that upper bounds for the first time, and it’s bigger than we thought: Antarctica alone may contribute up to 37 cm (14.5 inches) to global seas by 2100, more than triple previous worst-case estimates. There are four major sources of sea level rise that are related to human activity: thermal expansion (as ocean water heats up, it physically expands), melting mountain glaciers worldwide, the continental ice sheets of Greenland and Antarctica, and the pumping of groundwater for human use. According to the September 2013 report from the Intergovernmental Panel on Climate Change, the world’s oceans are currently rising at a rate of 28 cm (11 inches) per century. As global warming accelerates, that pace is expected to quicken exponentially. The IPCC report, which took a snapshot of the state-of-the-art science at the time it was written, estimated a worst-case scenario of 97 cm (38 inches) of sea level rise by 2100, with only about 12 cm (5 inches) coming from Antarctica. The new study, using models from the Sea Level Response to Ice Sheet Evolution (SeaRISE) intercomparison project, tacks on nearly a foot (25 cm, to be exact) to that scenario. As we saw during Hurricane Sandy in 2012, during big coastal storms, a few inches goes a long way toward crossing dangerous flooding thresholds, like filling the subways with sea water. Since there’s never been a study like this done before for the entire continent, there’s still better research needed, especially relating to how the ocean and ice interact. The authors were careful to include the full range of sub-surface melting sensitivities in an attempt to capture every plausible scenario. Since the study tried to model the entire continent’s behavior, the authors couldn’t look in detail at the inherent instability of the glaciers most likely to contribute to shorter-term sea level rise, namely the Pine Island and Thwaites glaciers in the Admunsen Sea region of West Antarctica. The Thwaites glacier is the one that made the news back in May. The three models the authors used also weren’t able to explicitly capture sudden nonlinear events like ice calving or other ocean-ice feedbacks that may accelerate ice loss. To account for this, the authors chose a probabilistic approach blending all three models, in part because there hasn’t been enough research done on the Antarctic to choose which model is best. Still, the new study pushes the urgency of coastal cities planning for the worst effects of the encroaching ocean. It’s also clear about one of the biggest remaining sources of uncertainty: humans themselves. What we do over the next few decades to slow the rate of fossil fuel emissions that drive global warming will help determine how quickly the oceans warm, and therefore how quickly coastal Antarctic glaciers are melted from below. The authors find that if the world gets in gear and sharply reduces its output of carbon dioxide, with a little bit of luck, Antarctica may not melt at all this century.